Scale used for layout work, drawing, measuring length, etc. In case of getting dirty, do not use it to thinner and alcohol, etc. The arrangement of the fine scale and the metal plate again make it very convenient when cutting a standard seal with a cutter knife etc. It is easy to use. Next I would like to consider 50cm type. This review is about item#68543413. This review is about item#68543422. It is solid and we are using it for seal cutting. I want to repeat. Since the SUS plate is attached to the side, the blade of the cutter does not dig into, Combined with a large cutting board, long objects can be cut at once in a pleasant manner. Acrylic made it easy to align with high transmittance. Because there is even more thickness, it is difficult to bend and bend, and it is difficult to cause misalignment. 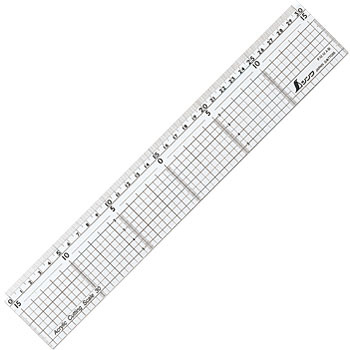 I like the cutter knife's blade does not cut into the ruler. I use it as a guide so that a cutter and leather knife do not ride while cutting. The side with no scale is protected with stain steel. There is a step of a few millimeters on the stain and main body stuck on the cutting surface. If you try to cut a piece of paper with a thickness of about 3 or 3 mm, paper enters that step and it will not cut to the correct size. I examined it. I can not find a flat thing with this step on the cutting scale on which sten is affixed, is there any? I would like a stain to be stuck on the entire cut surface anyway. A solid acrylic is used with a thickness of 5 mm and stable cutting work can be done. There is also a reasonable weight, it is an item that can be used forever. There is a width, there is a memory, there is a metal fitting on the cut face, it is convenient for cutting. I want another 10 cm long if possible. It was troublesome that there were few inexpensive merchandise on the cutting scale of 50 cm. The stainless steel part used for cutting is scraped by repetitive work, so if it gets old, things cut off will be lost straight. Therefore, it is recommended to periodically replace cheap items because periodic replacement is required.